The film utilizes footage from the opening of the original film in which we see a young Magneto being separated from his mother during World War 2. His anger over this brings forth a tremendous display of his latent ability, which is to manipulate and control metal. Unlike in the first film, where the timeline jumps forward to present day, this film takes us to the following day in which young Erik is brought face to face with Sebastian Shaw, though we never know his name at this time. It seems Shaw (Kevin Bacon) is aware of a growing number of humans who are displaying extraordinary abilities and naturally since he works for a government bent on power and control, he seeks to acquire this power for himself. Years later on an estate in Westchester, NY a young Charles Xavier is awoken by a noise in the kitchen and when he attempts to deduce the source he discovers a little girl with blue skin who can change her shape at will. He befriends her and after that they are inseparable. Once again we move ahead in time to when Charles (James McAvoy) and Raven (Jennifer Lawrence) are attending school at Oxford. Charles is about to graduate after majoring in genetics. They are approached by a government agency who claims they need assistance in handling a problem they believe only Charles can handle. It seems a man, Sebastian Shaw, who looks no older than he did 30 years ago, has been stealing weapons of mass destruction and selling them to the highest bidder. When Charles attempts to assist in the matter, he winds up running into Erik (Michael Fassbender) who has spent his adult life tracking Shaw seeking revenge. After their watery meeting Erik and Charles find themselves working together with other fellow mutants to try and gather allies for the coming battle. Using a new technology developed by a young mutant scientist they are able to track down mutants all over the world. Once their team has been assembled they have to be trained and that is where Charles comes in, luckily for him he has an entire estate left to him which is completely secluded from prying eyes. As the events unfold and Shaw readies to reveal his ultimate scheme it is up to these young and inexperienced X-men to find a way to stop Shaw before the world falls into chaos. There is a lot to say about this film, both good and bad. Let's start with the bad, the biggest problems here are the inconsistencies between the films. If we are to use the first three as a template, and we know any hard-nosed fan will, than we have to assume that any past experience mentioned in the first film was completely false given what was shown in this prequel. That is where most of the bad comes into play, true the story is somewhat thin and many of the characters in the film are just there to distract us and by the end of the film you get the feeling of being rushed. When Erik and Charles finally have their falling out it feels very flat. You never get the sense that they were that close, given what they show in this movie. Based on what we have seen before, they were friends for a long time before they finally went their separate ways. Here is what is good about the film; there is a lot of incredible CGI in the film, the characters we do get to see are fun to watch and personal enough that we can connect with them, and quite frankly Michael Fassbender does a great job playing Magneto. Now that the film dropped on Blu-ray any fan, and there were many given the film's success, can sit at home to enjoy this fun fantasy adventure film. The DVD comes on two discs; the first contains some interesting bonus features. First up is a behind-the-scenes feature titled "Children of the Atom" looking at the making of the film, a tool that lets you isolate the composer's score of the film, some deleted and extended scenes, another tool that lets you "track" mutants and catalog them, a viewing mode where you can watch small clips from the cast and crew either individually or during the film and lastly the High Definition version of the film. Also be on the lookout for BD-Live which lets you look up info regarding the film via IMDB.com. Over on disc 2 is a digital copy of them film for those of you who love to bring your movies with you on the road. Even though it had some obvious flaws the film did quite well and got a lot of good press. For a comic book movie or any movie for that matter that is a wonderful thing. Here is hoping that when they next venture into the world of mutants, they pay a little more attention to continuity. Download X-Men: First Class from the iTunes Store in Digial HD. 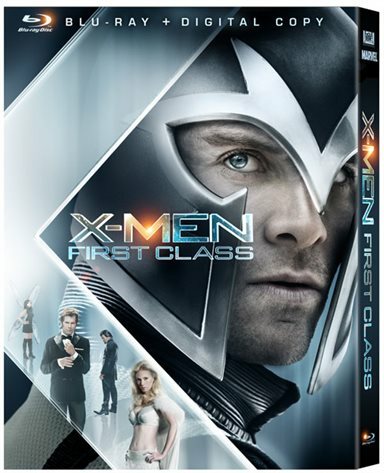 For more information about X-Men: First Class visit the FlickDirect Movie Database.